Google has taken YouTube to new heights since it acquired the popular online video service in 2006 for $1.65bn. And in 2010, it looked like the search giant would be able to continue to grow YouTube without worrying about the billion-dollar lawsuit media conglomerate Viacom had filed against it. That lawsuit, which alleged that YouTube and Google were responsible for copyright infringement of Viacom content, was thrown out of court on the grounds that YouTube was protected by the safe harbor provisions of the Digital Millennium Copyright Act (DMCA). Viacom appealed the summary judgment issued by Judge Louis Stanton, and today the lawsuit was reinstated by the US Court of Appeals in Manhattan, which found that, on several points, the lower court erred in dismissing Viacom’s lawsuit. “A reasonable jury could find that YouTube had actual knowledge or awareness of specific infringing activity on its website,” two judges at the US Court of Appeals in Manhattan wrote in their decision (PDF). So the District Court will have to pick up the case again, addressing the issues that the appeals court found it didn’t get right the first time. While this certainly isn’t the outcome Google was hoping for, it’s not all bad news. The Court of Appeals did find that three of the four software functions in question do qualify for DMCA safe harbor coverage, so while Viacom will have an opportunity to make its case, some of its legal arguments are off the table. All that is left of the Viacom lawsuit that began as a wholesale attack on YouTube is a dispute over a tiny percentage of videos long ago removed from YouTube. That may be the case, but it doesn’t mean that Google has nothing to lose. Conceivably, it could still be on the hook for some damages. The big question is what Viacom really stands to gain. Even if it manages to beat YouTube on the issues that are part of the reinstated lawsuit, that victory will still be of questionable value. Viacom, and media companies like it, need to play ball if they want to win in the digital space, and given YouTube’s popularity, playing ball probably requires dealing with YouTube, past (alleged) infringements notwithstanding. Regardless of how much money Android has generated (or, more accurately, hasn’t generated) for Google, there can be little doubt that Google is pleased with the fact that it owns the second most popular mobile OS in the world. But the popularity of Android isn’t without its problems. Fragmentation, for instance, has always been an area of concern for developers and handset manufacturers, if not for Google. 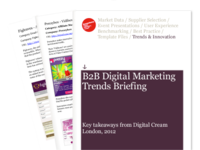 One of the key areas covered in our B2B Digital Marketing Trends Briefing is that of content marketing. Built on the views and experiences of B2B marketers who attended Digital Cream London in March this year, one point that was recognised by all was the importance of effective content when looking to become visible on the web. Bitcoin, the decentralized and anonymous (or almost-anonymous) digital currency, has been a top headline grabber in 2012. And for good reason: Bitcoin has not only gained more adoption than skeptics could have imagined possible, but it has created a fascinating discussion around how currency will evolve in the 21st century.